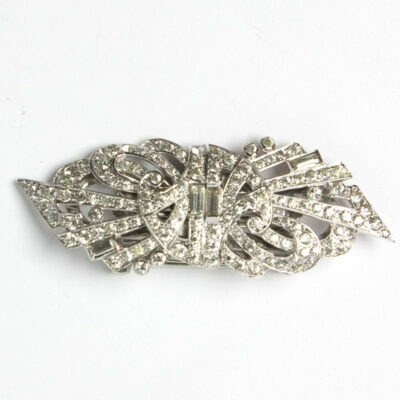 Double Clip Brooch | 1930s Art Deco Design by Mazer Bros.
Diamanté Double Clip Brooch by Mazer Bros.
Home>Shop by Maker>Mazer Bros. Jewelry>Diamanté Double Clip Brooch by Mazer Bros.
Brooch: 2 5/8" x 7/"; clip: 1 1/4" x 7/8"
This double clip brooch by Mazer Brothers features sparkly round and baguette diamanté in a late-Art Deco design. 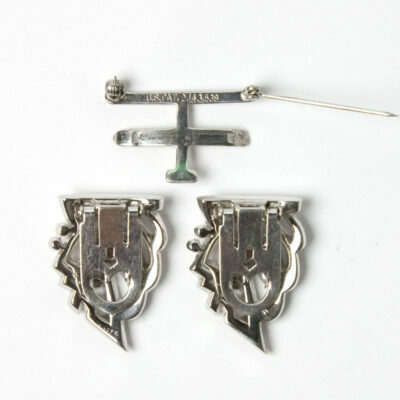 What’s interesting about this piece is that the patent for the brooch mechanism that connects the dress clips was issued to Marcel Boucher in 1939, two years after he started his own company. He filed the patent application when he was working for Mazer Brothers, but the patent wasn’t assigned to them when it was issued. (You can see the utility patent here, below Boucher’s name.) I was surprised to find the “MAZER” mark on this piece from the technical perspective but certainly not from an aesthetic point of view. Because this jewel was created with the Boucher mechanism, I think it was made while he still worked for the firm. 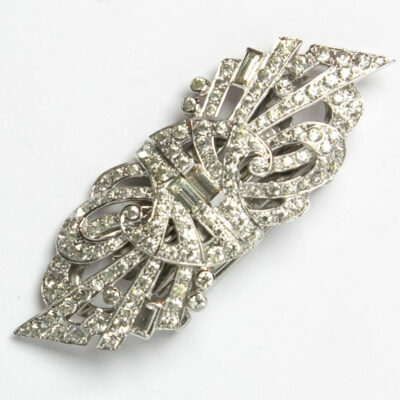 Wear this lovely piece as a brooch or as separate dress clips. Scroll down to see several complementary bracelets. 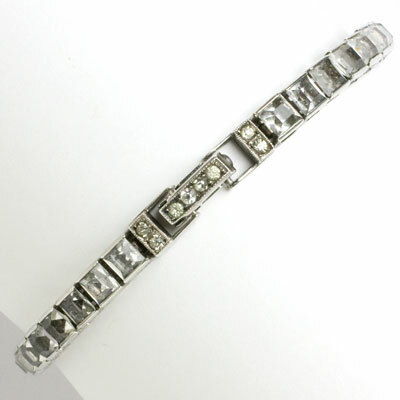 This silver buckle bracelet features two rows of round diamanté set in sterling. The concealed clasp has a flat, rectangular tongue with a floral-decorated release button in the center; the straight safety-clasp swivels. 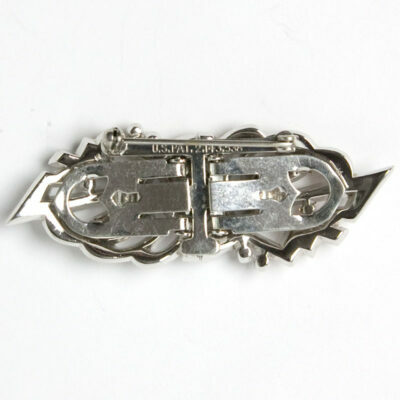 This style of clasp was used by Wachenheimer Brothers ("WB") late in their production. The back is stamped “3 20 17”, the date the patent was issued to them for the way the links are connected. However, even though this bracelet has these WB characteristics, it doesn’t have the Diamonbar mark. Some of the components or the entire piece may have been made by WB, but I believe this bracelet was sold by Otis, the company that purchased the equipment and inventory from WB after they went out of business. Read more about the connection between these companies. Scroll down to see a selection of lovely coordinating pieces. 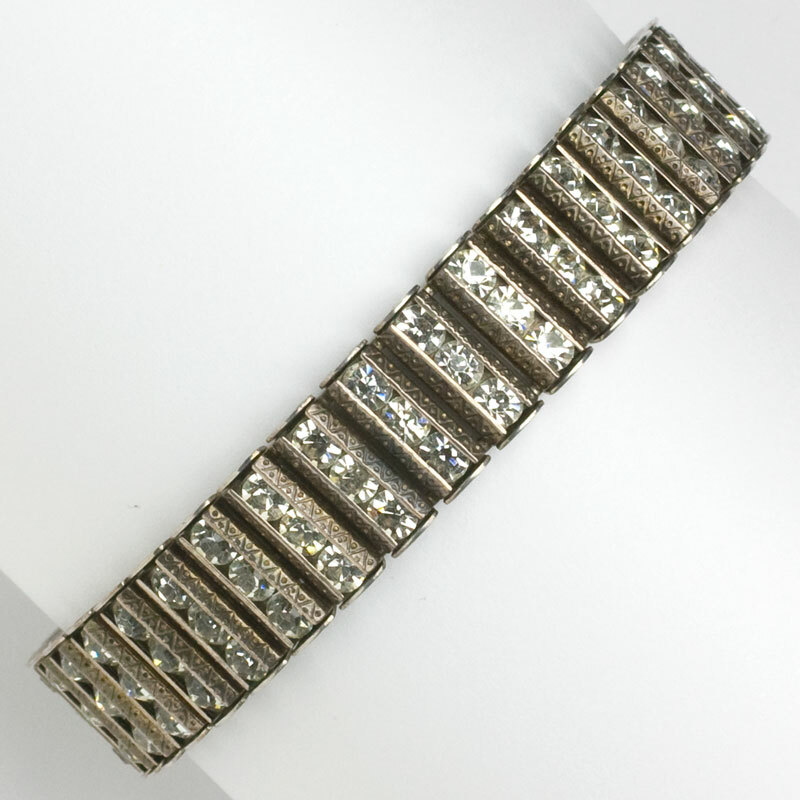 This vintage silver bracelet by Catamore has three vertical rows of channel-set diamanté. This well-articulated, well-crafted, sterling bracelet has engraved edges and settings. It closes with a concealed clasp and safety chain. 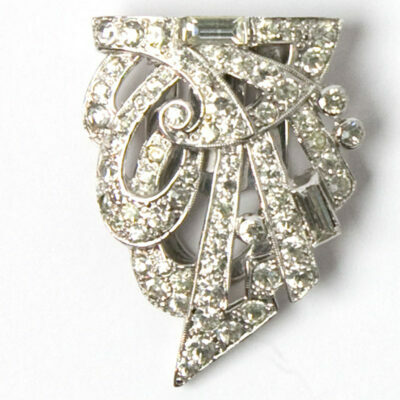 A similar piece by this maker was advertised in the November 15, 1946 issue of Vogue. This bracelet dates from 1942 at the earliest, since the company did not open until that year. Please note that this bracelet was made for a slim wrist. Be sure to measure yours and note the bracelet's dimensions (6 7/8" length) before purchasing. 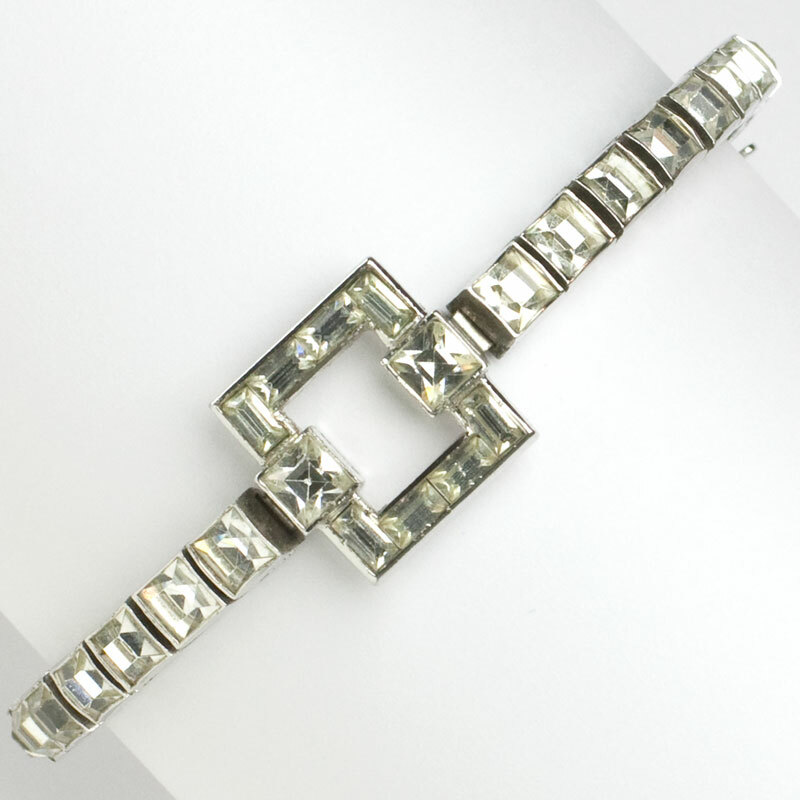 This Diamonbar bracelet has faceted, square-cut diamanté in a sterling silver box setting. 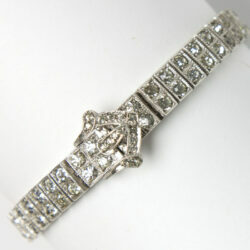 Its excellent articulation makes this bracelet an Art Deco classic. Made in the 1920s, this piece closes with a concealed clasp and figure-8 safety catch. This stunning bracelet was made for a slim wrist, so please note the bracelet length (6 5/8") and check your wrist size before purchasing this piece. It can be worn alone or with line bracelets with colored stones – scroll down to see a selection of beautiful companions. This bracelet walked the runway at Toronto Fashion Week for Spring 2019. The model wore it with a bridal gown and exquisite flower earrings by Dior. This diamanté and sterling silver 1940s bracelet by Dorsons takes the line-bracelet design one step further. Square-cut diamanté channel-set in rhodium-plated sterling silver are enhanced with two squares of clear baguettes. This well-made bracelet with excellent articulation has a concealed clasp. All-diamanté pieces are really hard to photograph, and this one is no exception. All stones are clear and bright, and the overall effect is much brighter than my photos indicate. In fact, this lovely bracelet sparkled on the runway at Toronto Fashion Week for Spring 2019! 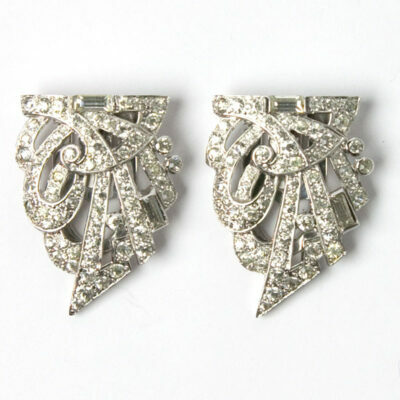 The model wore it with Art Deco crystal bead pendant earrings. Scroll down to see them and other coordinating pieces. 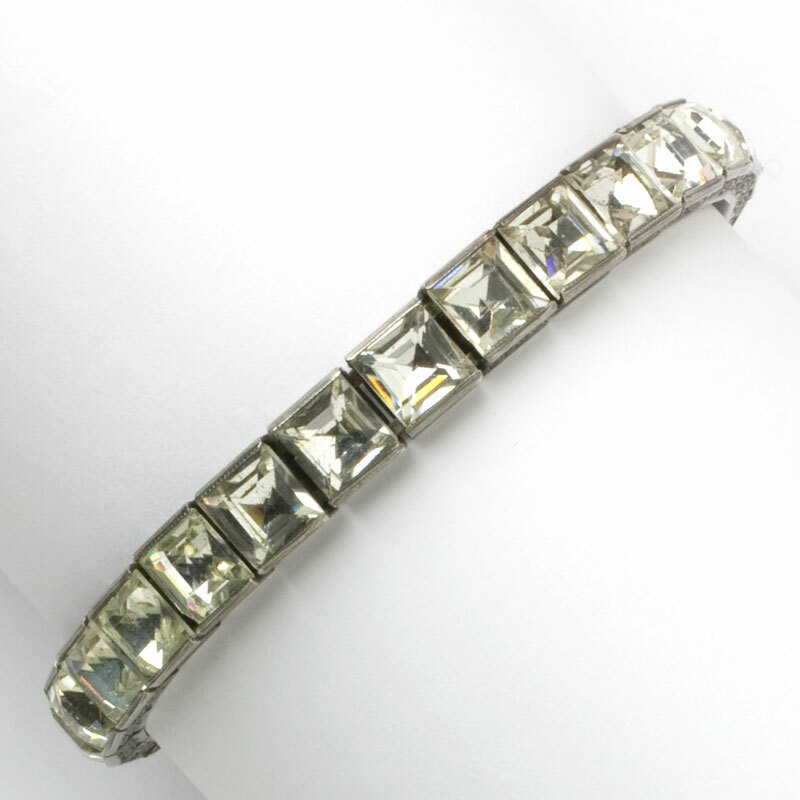 This Otis sterling bracelet is a lovely example of an Art Deco line bracelet, the forerunner of today's tennis bracelet. It features faceted, square-cut diamanté channel-set in rhodium-plated sterling silver. Engraved edges and a diamanté-embellished fold-over clasp complete the design. The excellent articulation speaks to its high-quality construction, which actually was the same as that used by Wachenheimer Bros. (Read about the companies' connection.) Bracelets in this style (known as flexible bracelets in that era) were all the rage in the 1920s-1930s and were typically worn in multiples. You can see this one paired with other line bracelets in the photos. Although the stones have aged a bit, this jewel still has lots of sparkle. Scroll down to see coordinating pieces.